Sunday, my family attended our twin cousins’ bat-mitzvah. It was a formal celebration. My boys got to wear their suits! The final celebration (party) was held in a catering hall – complete with entertainment, cocktail hour, dinner and Viennese table! It was like a wedding reception. So what’s a bat-mizvah anyway? If you ask my 8yo, he thinks he’ll say it’s a birthday party where you feel like a truly lucky person. Bat means daughter, mitzvah means commandment. Becoming a daughter of the commandment means that Jessica and Brittany are now considered adults within the confines of the Jewish community. The twins read from the Torah and the Haftorah. The readings are performed with great ceremony. It is important to value these times because there were times in the past (history) when one is prohibited to read from the Torah. In order to be go through Bat-Mizvah, one has to do some community service. The twins did fundraising for the guide the dog foundation. They were so successful that they were featured in the local news, recognized by the senator and awarded some cash prizes. For my children, the best part of the celebration is the party and being. It’s not the endless food and beverages during the cocktail hour but the entertainment, music and a chance to dance and have fun! 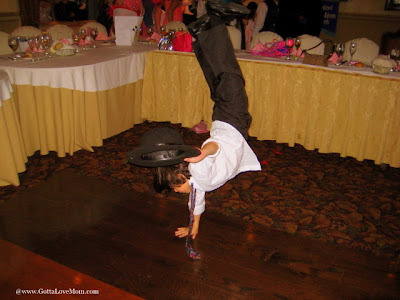 My 8yo danced and did his hand-stands the entire night! I’m happy for the twins. Every one was having a ball and the twins were lucky enough to be able to have such celebration. And as my 8yo once said, "We are definitely are lucky to be a part of it!" Family traditions and celebrations of faith are very much part of who we are. It’s not the venue but the togetherness, laughters and joys that will always be in our memories. It’s the simple reminders of the beauty of life. Copyright © 2009 GottaLoveMom CJ Solutions, Inc.
As proof that I totally heart your blog,I'm giving you the blogger buddy and zombie chicken awards. Grab them from my blog! WOW Jenjen...What a beautiful post! Your right...it is in times of faith that we can be together with the ones that mean the most in our lives and enjoy the celebrating of a happy event! Fun! I love their version of the Hora.